NZXT continues to leave their mark on the PC world with an ever growing array of products. Today we are going to look at their Sentry 2, a touch screen fan control panel. While not a necessity to get your PC up and running, can the Sentry 2 add more features and flair to help separate your PC from the many out there? The promotional image above provides a quick look at the Sentry 2. This device is intended to occupy a single 5.25" bay in a computer case, and all of the information and controls are provided on the touch sensitive screen. While you could obviously use it in a case of any color, it may look best in a black one, since that is the only color the Sentry 2 is available in. Before taking a closer look at the sample provided for review, let's cover some of the published data taken from the official product page on the NZXT website. 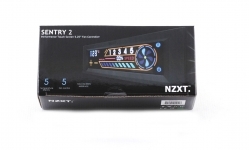 The Sentry 2 is the second fan controller available in NZXT's Sentry line-up. We reviewed the other model, the Sentry LX, earlier this year and the big difference is that the Sentry 2 can fit in a single drive bay while the Sentry LX takes up two. NZXT has tightly packaged the Sentry 2 in a small box with a picture of the product on the front. 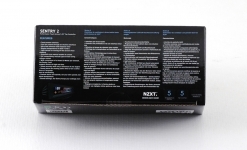 As you can see below, NZXT continues to give multi-language support as the features are displayed in four different languages on the back of the box.